I’m always interested in artistic motifs that seem particularly important to certain cultures. What motif recurs in our world now? We’re so bombarded with imagery in contemporary society that I can’t think of one image that is currently iconic. One particularly revered subject in the past was the horse, particularly in China. Perhaps no animal has had a greater impact than the horse throughout China’s long history. It was domesticated in northeastern China as early as 5000 years ago. During the Shang Dynasty (ca. 1600–1100 bce), horses were so honored that they and the vehicles they pulled were buried in tombs with their owners to ensure a successful transition to the afterlife. As the Chinese kingdom grew, horses became a necessity for transporting goods and maintaining contact between parts of the far flung empire, as well as waging military campaigns. While horses have been depicted in the art of many cultures the world over, it seems to me that the Chinese pay special attention to according their artwork of horses a particular air of dignity and elegance. 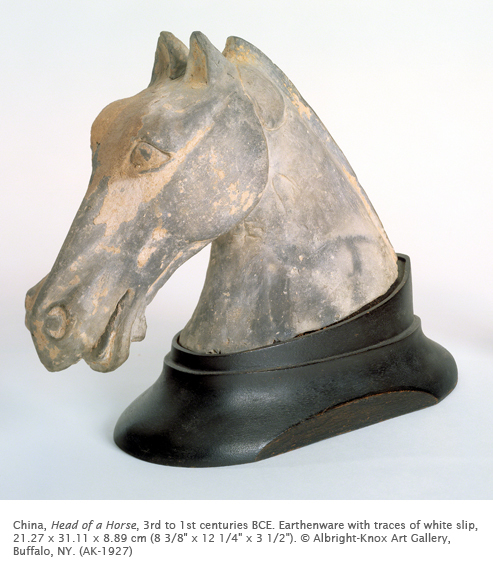 This horse head dates from the late Han Dynasty. The Han Dynasty in China (ca. 206 bce–220 ce) was one of the richest periods of Chinese art in all media. The image of the horse played an important role in the religious beliefs of early China. It was closely associated to the dragon, where both were thought to be capable of flight, carrying their riders to the home of the immortals (the afterlife). The ability to fly has always been associated with survival in Chinese art. This gorgeous, elegant example of a horse’s head is most likely part of a full figure sculpture. 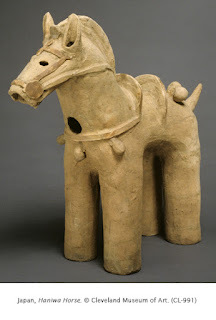 Such ceramic horses are most famous from the Tang Dynasty (617–907 ce) tombs in which they were included in lieu of horse cadavers. The horse has played an interesting significance in many other cultures’ art. In the West, the horse was a symbol for women, while the bull was the symbol of the male (go figure). 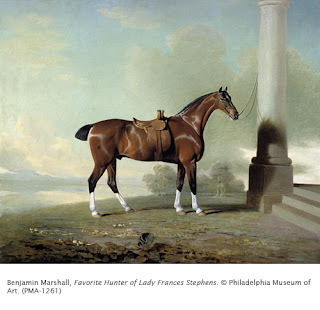 Without dwelling on the beauty of the horses in the TV show Gunsmoke, let’s look at some other significant horse subjects from throughout art history. Haniwa figures were placed around tombs in ancient Japan. They were meant, as in ancient Egyptian and Chinese tomb objects, to serve the needs of the deceased in the afterlife. 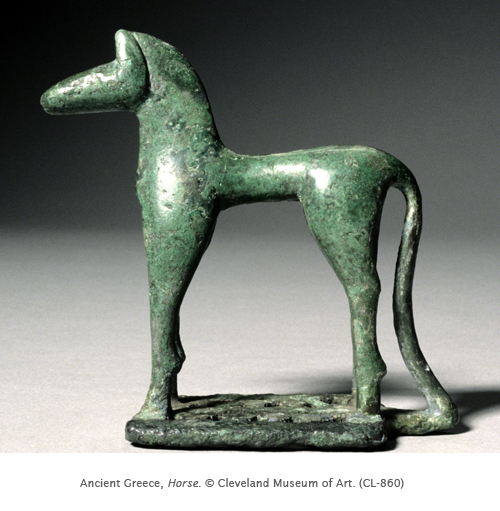 In ancient Greece, horses were considered just slightly less important than the gods. They were a symbol of wealth, because pasture for horses was basically only available to the wealthy. At the same time it was a sign of “rank” to have one’s portrait painted full-length, it was fashionable in late 18th and early 19th century Britain to have a portrait of one’s favorite horse (see George Stubbs). The intent was the same – to display one’s status and “good taste”. Although initially intending to be a veterinarian, Deborah Butterfield chose to be an artist. She moved to Montana and has been best known for her sculptures of horses. 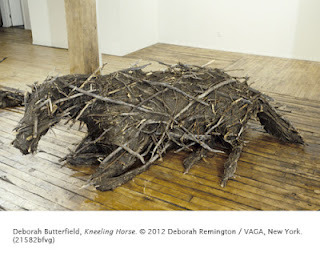 In the last 30 years she has depicted horses in an astonishing range of media, including automobile parts, plaster, and branches and mud. Activity: A beautiful animal. Using a slab of clay, carve a favorite animal. Look at pictures of animals or observe them at a local zoo. Make a clay slab. Cut out the shape of the animal so that the shape touches all four sides of the slab. Create textures using different tools such as paper clips, pencils, etc.